My mom clipped this from the anchorage paper. 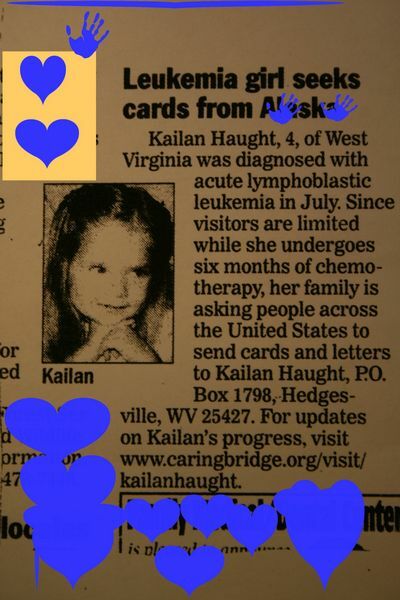 How wonderful would if be if this sweet little girl were to get cards from all over the world? I am sending her one today. I hope some of you will join me and send her one as well! She is only 4 so a cool post card with a bright and fun photo of where you are from and 'GET WELL SOON' on the back would be enough! Thanks for adding her to your blog my sweet girl! I love the quote! Did you look at the face in my last painting. I thougt it looked a bit like Darian when she was about 4. I really wasn't trying to make it look like anybody, just wanted it not to look too dumb.